Are you trying to figure out how to get a beautiful smile? One of the best cosmetic options is going with dental veneers. They can cover up many common issues with your teeth, and can give you a gorgeous smile, for less than the price of crowns, and a far less invasive procedure than dental implants. Most of the time, we are even able to help get some of the procedure covered by your insurance to make it a much more cost effective option. If you happen to have issues with your teeth where you shy away from giving the world your big beautiful smile, then you should speak with your dentist about getting veneers. 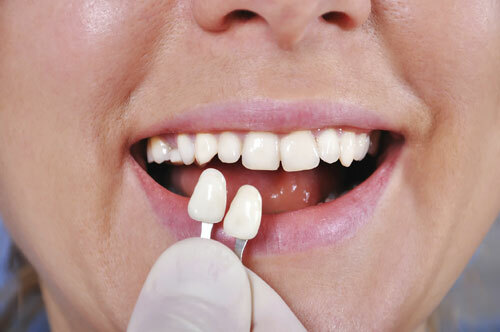 To place dental veneers, it is a two visit process. During your initial visit, we are going to buff your teeth down slightly, removing just a small layer of your teeth so the veneers will have something to bond to. From there, they will make an impression of your teeth to create the veneers from. An outside laboratory is going to use that impression and create a set of veneers which will later be bonded to your teeth. Once the veneers are returned to our office, you will come back in for a fitting, adjustments if they are necessary, and the bonding process. Once your veneers are set and bonded to your teeth, they can easily last you quite a few years if you maintain them properly. Dental veneers are a great way to get the smile you are looking great with a relatively simple procedure. It gives you the ability to lighten and brighten your smile, and it allows you to fix imperfections in your smile that would otherwise be holding you back. Getting dental veneers is an easy process so long as you are going to an experienced dentist, like Dr. Mahar. If you notice and discomfort during the procedure, you can always get a mild anesthetic to take that discomfort away, making the process nearly painless. If you want to find out more about dental veneers, give us a call at Mahar Dental. We want to be able to help you put your oral health at the top of your priority list, and we also want to help you get the smile you both want and deserve. Schedule an appointment to come in and speak with Dr. Mahar about what options you have, and between the two of you, you can come up with a plan to make your dreams of a healthy, vibrant smile into your reality. Call us at (315) 766-2770 and set up an appointment today!